My sister Cheryl had a birthday recently. I asked her about retirement (maybe in a couple of years) and it got me thinking about her life and career as a social worker in Detroit (since 1972). I really admire her for devoting her life to making the world a better place and got the idea to honor her in some way now instead of just waiting until she retires. I was fooling around with some metal scraps left over from some other recent projects and wound up making the object you see above. It's sort of a cross between a trophy, a crown, and a globe. 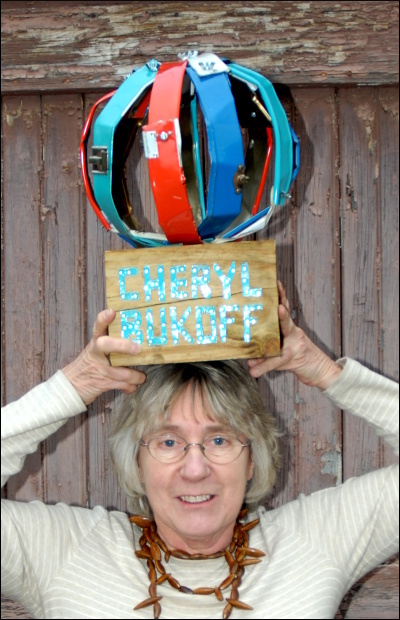 [Some people would not consider a junky object like this to be a prize, but Cheryl has always prized the stuff I make.] So thanks, Cheryl, and here's to celebrating your spirit, dedication, and career. Click here for more object photos.